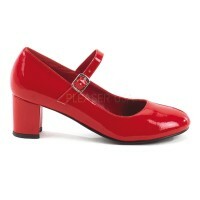 Red Glitter Mary Jane platform pump has a 4 inch stiletto heel and comes in sizes up to 14. The Mary Jane has a classic pump shape and buckled strap making it perfect for every day with every outfit. The heel is 4 inches, platform about 1/2 inch. The square heel and platform adds a lot of stability making it a favorite for those wanting to get used to a higher heel and crossdressers. This style is made in medium width, womens whole sizes 6-14. All man made materials with padded insole and non-skid sole. Item Number: PL-MARYJANE-50GR | Approximate Size (Inches): 12.00 wide x 14.00 deep x 8.00 high | Approximate Shipping Weight: 4.00 lbs.